Aly D. submitted this photo and caption. After the unfortunate bus accident, near Minden, Iowa, at the start of our tour, one of the Troopers guard members was given a teddy bear by an ambulance crew. 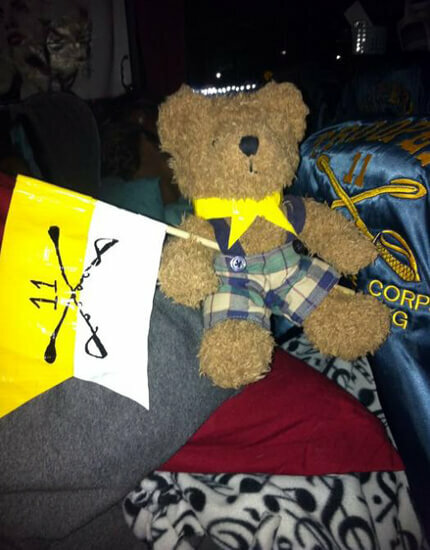 Since he was already dressed appropriately in Trooper blue and gold, we adopted the teddy bear and named him Minden. We made him his own scarf and crossed sabre flag. Minden accompanied us on the field for every performance this year and had a front row seat on the 50 yard line and is an honorary member of the Long Blue Line.